Breast cancer has become an exposed hidden killer of men and women around the world. Once confined to silent dormancy inside the body far from human observation it would silently commit its heinous crime against the unknowing victim. But over the course of time, scientist have made strides to detect and remove this unwanted inhabitant prolonging the life of its would be homicide. Science daily reports people are taking greater steps towards early detection by self-examination and regular mammograms with the health insurance industry backing the cause of awareness. The famous pink ribbon campaign has brought to the forefront the silent fight against cancer showcasing survivors and promoting breast cancer awareness. Medicine has taken a radical approach at decimating this silent killer through a procedure called a radical mastectomy removing the infected breast tissue and attached lymph nodes. However for some women simply taking care of the present problem is not enough and many are now opting for a bilateral mastectomy removing both breasts at once due to the high occurrence of cancer detection in the second breast. Geneticists have identified the DNA marker of those predisposed to breast cancer known as the BRCA gene mutation. Even these women are choosing mastectomies rather than risk of developing breast cancer. It seems like such a radical move for those who are in danger of developing cancer and baffles others who do not understand the significance of seeing cancer devastate a life until it is too late. Removing the risk is the only option for many who have seen a loved one die or those who want no part of cancer and its dirty work. Sin is a cancer of the soul. It lies deep inside of human beings as a silent killer. Its mutation seems harmless with little mistakes here and there until ultimately it steals life and robs people of their future along with the promise that it holds. How unfortunate when we disregard taking the radical steps necessary to remove sin and its potential from our life? 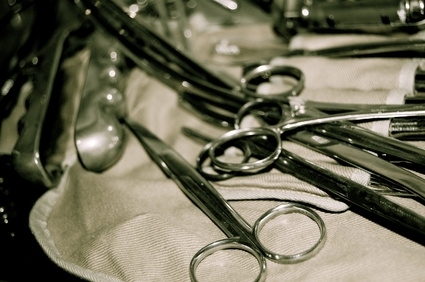 Removing a body part only on the chance of developing cancer must be a huge dilemma. One must consider not only what if it becomes cancerous with the option what if it does not? Believers have the same dilemma daily while toying with sin. What seems like harmless fun or momentary weakness has the power and potential to take your life away in an instant. Jesus did not talk about a twelve-step process for sin removal. Sin is not an addiction, it is a disease which calls for its immediate removal from our lives. What person chooses to allow cancer to live in their body willing? No one – they feverishly seek to have cancer remove and discarded from their life. Why not treat sin the same way? Jesus calls for a radical “sin”ectomy. A sinectomy as defined by medical terms refers to sinus surgery to remove unnecessary or dead tissue and cartilage and by the spiritual description of Jesus Christ it is removing unnecessary and dying sin from our body, mind and soul. Sin has the potential to kill a person. Why do believers quandary and waiver over harboring the fugitive of sin in their bodies? A known killer of the unrighteous, yet we choose to hang on to these habits, ideas, actions and notions in lieu of life and freedom. Bound by our addiction to self and self-gratification, our vanity prohibits spiritual wellness by keeping the offensive in order to be physically whole. Jesus said it would not be easy but we must remove the offensive from our lives in one radical motion at the presentation of sin. The thought of sin is contaminating and must be discarded. Wide margins of faith are required to surround the area of weakness and promote healing once again. There is no excuse. It is a life or death choice. Will you sacrifice sin for life today? Ignoring the deadliness of sin is not immunity for the human heart. The Lord searches the hearts and minds of His People regularly to detect sin and weakness. In that moment, He alerts the Holy Spirit who by careful goading and prodding will bring it to your attention. It is a preventative measure on the part of a God who loves you so much that He longs to see sin removed from your body. It is a desperate search of the Father to save His Dying Children. Sin is eating His People up from the inside out and so God is pressing. His Hope is that by the Blood of His Precious Son, Jesus Christ that you will accept a second chance at life that is only possible by removing the sin from your life – all of it. You would not allow cancer to steal your life – you would fight for it relinquishing whatever body part necessary to regain your life. Why would you allow sin to fester and steal away Eternity? It just doesn’t make sense. It is time for a radical “sin”ectomy in the Body of Christ through the hearts of God’s People. The Spirit of the Sovereign Lord is upon me for the Lord has anointed me to bring good news to the poor. He has sent me to comfort the brokenhearted and to proclaim that captives will be released and prisoners will be freed. He has sent me to tell those who mourn that the time of the Lord’s favor has come and with it, the day of God’s anger against their enemies. To all who mourn in Israel, he will give a crown of beauty for ashes, a joyous blessing instead of mourning, festive praise instead of despair. In their righteousness, they will be like great oaks that the Lord has planted for his own glory. God has a promise for those who endure the painful process of refinement and strive to remove sin from their life. It is righteousness. Righteousness is a second chance at life that makes all former things pale in comparison to His Goodness. The pruning of your life has produced roots that link you to the Kingdom of God and the resources available there are abundant and innumerable. You cannot fathom the richness of God afforded those who will sacrifice sin for His Glory. Do some self-examination today. Seek the advice of a professional – the Holy Spirit. Radically eradicate sin from your life. Experience the fullness and wholeness of God. Be free to live for Him and enter Eternity. It is truly a matter of life and death!